Had a good time at the D23 Expo up in Anaheim over the weekend. 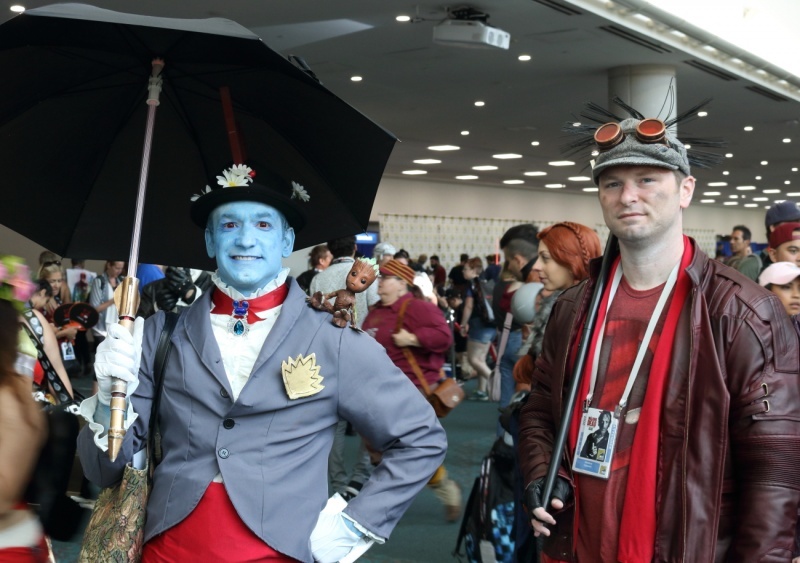 If it was my only convention-type event over the summer I would have said great, but following in the heals of The Con, aka San Diego ComicCon, I had to accept that it pales in the comparison. It suffered the fate of an event that couldn’t live up to its media hype. It is what it is: a fan event for a single entertainment conglomerate. It lacks the diversity of thought and has none of the small press and independent artist exploration opportunities of ComicCon, and was in a relatively sterile corporate neighborhood. That last part was probably my biggest hang-up. Over the years I’ve been repeatedly told that this is one of the events that makes Anaheim a contender to take ComicCon from San Diego. ROTFLMAO. It has parking – gotta give it that. They need it because their local public transit was clearly not up to the task (looking specifically at you, Anaheim Resort Transit). But that part of Anaheim lacks the flavors and diversity of dining in San Diego’s Gas Lamp, and if D23 was an example of what Anaheim would do to support a Con like San Diego’s ComicCon, the answer appears to be nothing. No restaurant tie ins. No off-site events. Not that you want to go outside because access to the building was limited to a few select (and understaffed) doors, resulting in excessive waits every time you needed to enter or re-enter the Anaheim Convention Center building itself. But once I accepted the differences, it was a good time. The tie-ins for Star Wars Battlefront (the new game) and Alice Through the Looking Glass were first-rate. The panels we were able to attend, and particularly the retrospective on Disney’s Silly Symphonies hosted by Leonard Maltin and accompanied by a live 32-piece orchestra, were great. One last rant though to certain vendors, and you know who you are: if you sold something at ComicCon as a ComicCon exclusive, don’t just put them on the shelf again for D23 (or any fan event for that matter). At least have the class to cover up the “Exclusive” label. Comic-Con has come and gone. I didn’t shoot much with the Canon, but took some GoPro video that I will hopefully have a chance to go through and edit into something pretty in the near future. I’d like to say I’ll be able to slow down and catch up once Randy goes back to school next month, but business is being good to me at the moment, and I need to bill the hours before they see me and run away like startled deer. At least I’ve been swimming more regularly, and the weather’s been perfect for tanning when one of the joints is saying no to swimming, so at least it looks like I’ve been having a fun summer. Too much of a good thing is kind of a Southern California summer tradition. Unfortunately this summer choices will have to be made: someone scheduled the San Clemente Ocean Festival on Comic-Con weekend. Maybe I can find an Aquaman on Thursday or Friday who would like to watch the dory races with me on Saturday morning. At a Comic-Con panel this morning I had the pleasure of hearing Deepak Chopra, Grant Morrison and Deepak’s son Gotham Chopra discuss the concepts of superheroes. As part of Deepak’s introduction to the panel’s discussion he listed a variety of synonyms for the concept that good and evil are necessary adversaries: angels and fallen angels, particles and anti-particles, and finally change and inertia. Every time during the day that I caught another news update about the budget show in Washington I kept flashing back to that line, and while I believe Deepak’s logic is correct, am having a lot of trouble seeing anything coming out of Washington, or government in general, to play ‘change’ and take the side of good in the current story. Taking a break from dealing with the real world for a bit. Time to focus on the wild and fantastic sides of life, and celebrate the announcement the ComicCon will be in San Diego for at least five more years. 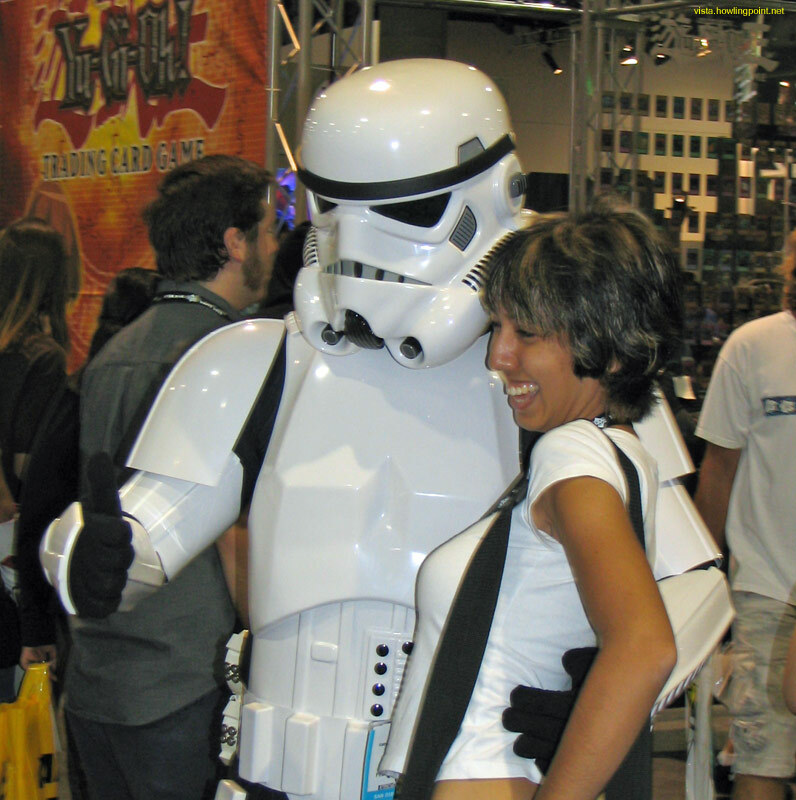 Time to par-teh like a stormtrooper! Chuck posted this on Thursday, September 30, 2010 at 4:28 pm. Comments Off on Five More Years! At least from our vantage point, the Comic-Con organizers seem to have finally figured out a registration process that makes sense. We went to the off-site location, showed our IDs and e-mail registrations, and were politely handed our badges. Twenty-one minutes from parking to putting on the lanyards. Photos from this year will be going up in this album. 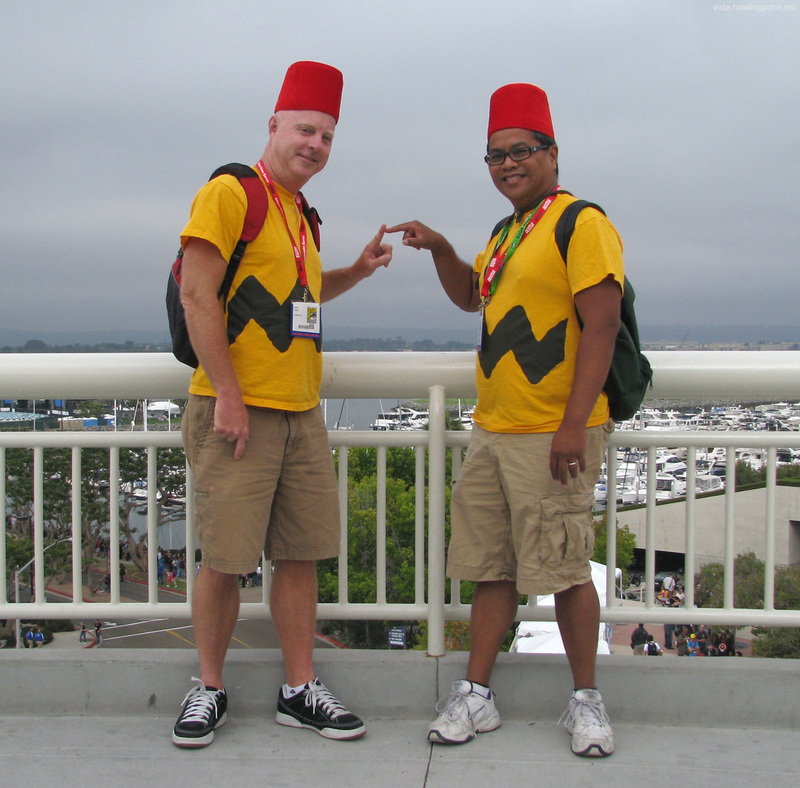 I’ve thrown together a dynamic album of all my Comic-Con shots here for those interested in past years as well. Chuck posted this on Wednesday, July 21, 2010 at 4:20 pm. Make the second comment.